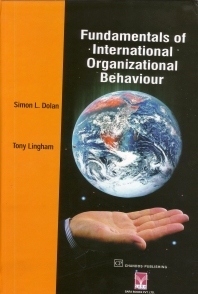 Fundamentals of International Organizational Behaviour is a product of not only the authors’ lives, work, teaching and consulting experiences across the world but particularly in teaching courses on organizational behavior to students that come from different parts of the globe. This book reviews influential theories such as Experiential Learning Theory that benefit faculty and students focus on engaging in the process of learning (both at the individual and team levels) as part of organizational behavior course. Both historical and fundamental aspects of organizational behavior are assessed so as to cater to the diversity of knowledge and related experience in the fields of psychology, sociology or business. What is organizational behaviour? Understanding individual behaviour in organizations; Motivating people in a global environment; Managing work groups and teams; Leadership and executive coaching: The keys to success; Enhancing effective communication in organizations; Managing power and conflict in the workplace; Understanding decision making processes in the international arena; Managing stress and enhancing well-being at work; Managing change and culture reengineering: The ABC of managing by values; Managing careers in global contexts; Managing diversity and cross cultural issues; Emerging and contemporary themes in global organizational behaviour. Dr Simon L Dolan joined ESADE Business School in Spain in 2001, after spending over 25 years in Montreal serving as full tenured professor at the University of Montreal (full time) and at McGill University (part time). ESADE ranks today as one of the top 10 business schools in the world. In ESADE he holds an HRM/OB chair, and is the scientific director of IEL (Institute for Labor studies). Dr Tony Lingham is at the Department of Organizational Behavior, Weatherhead School of Management, Case Western Reserve University where he teaches the LEAD program, conducts leadership development programs for top MNC executives and continues studying and publishing his research on team learning and development using his Team Learning and Development Inventory (TLI). He is also a Visiting Professor at ESADE Business School in Barcelona, Spain.